If a thorough termite inspection reveals an infestation of termites in your home, then you will soon be wondering how to get rid of them. While the treatment that you choose will vary depending on the severity of the infection, you will need to know the most common removal methods. That way, you will be sure to go with the best treatment option for you. Your instinct will probably be to hire a professional termite control company. However, once you start receiving price quotes, you may want to look at do-it-yourself removal treatments. If you know the signs of terminate damage and catch the infestation early, then you may be able to rid the termites inexpensively yourself. You do not need to get overwhelmed when deciding how to get rid of the termites in your home. You just need to know the most common DIY removal methods and how you can apply them yourself to your home. One of the strongest and more effective methods to get rid of termites in your home is by using a liquid termiticide. A liquid termiticide can not only act as a removal but also as a preventative treatment. It is virtually undetectable to termites and is applied to the exterior of your home. It can also be used around any wood structures along the exterior of your house such as piles of wood, woodshed, and tree stumps. When you apply liquid termiticide, it can last several years. If you hire a professional termite control company, then the chances are high that they will use this removal method to treat your home. When applying liquid termiticide to the soil surrounding the foundation of your home, you create a barrier. That way, upon contact, the termites will not be able to penetrate your home without contracting the pesticide. Liquid termiticide can also help kill termite colonies already inside your home. If termites crossing into your home are exposed to the exterior liquid termiticide, then they will carry the pesticide into your home and to the existing termite colonies. If applying a liquid termiticide solution seems too invasive or if you do not have that severe of a termite problem, then you may want to opt for poisoned termite baits. Professional pest control companies also use them to treat termite infestations. Not only do they cost less than liquid termiticide solutions, but they are also less time-consuming to apply. Applying poisoned bait is beneficial if you do not want to spray the outside of your home with heavy pesticides. Like liquid barrier termiticide, you apply poisoned baits to the perimeter of your home. When the baits are penetrated, stakes pop up from the trap, notifying you that your bait system is activated. 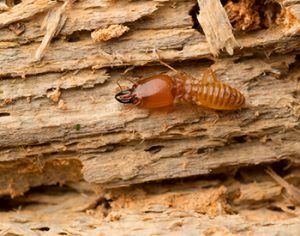 After termites infiltrate the bait, they bring the poison back to the termite colonies which spread among the termites. When you apply liquid barrier termiticides and poisoned termite baits, you do so to the exterior of your home. Then, the contaminated termites bring the poison into your home and spread it among the other termites, which ultimately kills them all. If you want to apply a direct termite solution to the inside of your home, then you should look into chemical treatments. One treatment can last up to a month, and it is a common solution applied by professional pest control companies. If there are signs that you have termites in the home, then you will need to eliminate them right away. While sprays are inexpensive and easy to apply, they may not kill an entire colony of termites. Therefore, you will have to use the treatment more than once and with frequency. If you are looking for a solution that is not a pesticide and is not a “natural” solution, then you should look into borax. Borax, which is a salt from boric acid, is commonly used to get rid of the termites in the home. It is a white powdery substance with colorless crystals, and you can often find borax in your laundry and household cleaners. Borax may not be a natural termite removal remedy, but it is lower in toxicity compared to the three above removal methods. Borax acts as a poison to termites because when consumed, it interferes with their digestion, which leads to their death. However, it can take up to a week after congestion for the poison to kill the termites. During that time, your home can be exposed to more termites. If you are sensitive to exposing your family to pesticides, then you may be wondering if there is a natural way to get rid of the termites in your home. If your termite problem is not classified as severe or you are looking for preventative methods, then you may benefit from natural termite removal methods. However, pesticides and chemicals found in the above removal methods are extremely effective and will most likely need to be used if your termite problem is severe. Therefore, natural removal methods will not rid your home of termites if you have a serious infestation. For a natural solution to rid your home of termites, you can turn to nematodes. Nematodes are a type of parasitic worm that termites enjoy eating. Once consumed, they take over the termites’ bodies and feed on them, ultimately killing them. While harmful to termites and other insects, nematodes do not have any effect on humans. As much as you may not want to seek professional help, at times, you may have no choice. Maybe your DIY remedies only worked for a short period or you realize that the termite infestation in your home is greater than initially expected. No matter the reason, when you seek professional help, be sure to choose a reputable company. Read reviews online and ask for price quotes from several different companies. Professional pest control companies are experts in ridding termites from homes. While expensive, they will get the job done right the first time around.